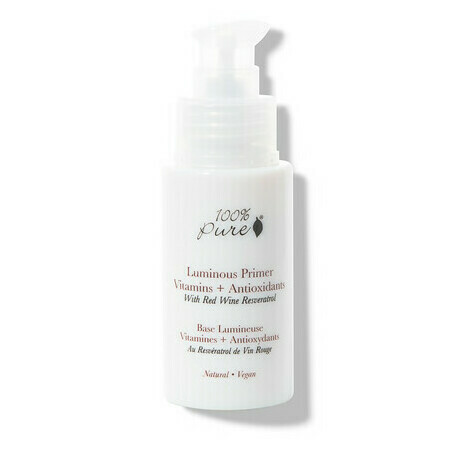 This 100% Pure Luminous Facial Primer is a luxurious, illuminating natural primer that works to diffuse uneven skin tone and wrinkles, while providing a perfect base for foundation. A light, milky gel that leaves skin feeling silky smooth and fresh, this product is packed with vitamins and antioxidants, including Vitamin C and Red Wine Resveratrol, and instantly helps to create a brighter and more luminous complexion. Made in California. 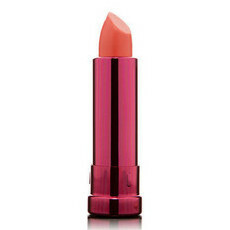 Vegan, Gluten Free and Certified Cruelty-free by both Peta and Leaping Bunny. 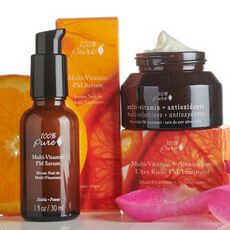 Free from silicones or mineral oils. Packaged in post recycled glass and printed with biodegradable soy ink. Aloe Vera, Jojoba Oil, Red Wine Resveratrol, Silica, Vitamin C, Vitamin E.
A couple of small pumps are all you need to cover your whole face. Apply to skin after your moisturiser, allow to dry and apply your liquid, cream or powder mineral makeup for a flawless complexion. 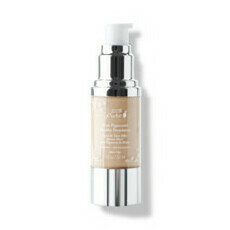 You can also mix together with your liquid foundation for a quick illuminating Beauty Flash Balm effect. Does what it says. Smells a bit strange. Didn't like this as much as other products by 100 pure. Won't rebuy. I have used this product several times and have been very pleased with it. However my last bottle has a different unpleasant smell and it not so smooth as usual. I probably won't buy it again.